On April 24, Minnesota Sen. Amy Klobuchar scheduled a hearing. Fun story, right? A hearing in Washington is like a fern in the rainforest. But this hearing was notable for both its subject and its attendance. It was a meeting about the most important economic crisis facing America today: long-term unemployment. At 10:30am, the hearing began. She was the only attendant. I have two stories for you about Washington and the economy. Both true. But very different. The first story is called: How Washington Saved the Economy. You might begin in 2008, when the Federal Reserve went on an unprecedented spree of asset-buying to un-gunk the banks, push down interest rates, and spur investing in mortally weakened economy. This was followed, in 2009, with an equally historic stimulus package aimed at filling holes in state budgets and sending cash back to families and businesses. The government ran steep $1+ trillion deficits to keep as much money in the weak private sector as possible. There is little question that monetary and fiscal stimulus blunted the recession -- and saved the economy. The second story is called: How Washington Permanently Scarred the Labor Market. You might begin this story in 2011, when Congress (led by Republican obstructionism) embarked on a historic quest to crush deficit spending by any means necessary. Hold the economy hostage over the debt ceiling? Check. Kill the American Jobs Act while scheduling a too-awful-to-be-a-real-law sequester? Check. Allow the too-awful-to-be-a-real-law sequester to become a real law? Checkmate. The deficit fell fast. As unemployment ebbed, the ranks of long-term jobless calcified, creating two separate job markets. One broken market for people out of work for more than six months. And another slowly healing market for everybody else. But the combination of a thermostatic recovery and a deep aversion to stimulus crushed any hope that the long-term unemployed would get the help they needed. Long-term unemployment isn't special just because it's longer; it's special because it's self-perpetuating. Skills atrophy, networks dry up, and employers discriminate, creating a vicious cycle of joblessness that can't be cured by normal economic growth. This isn't so much a tale of two cities, but a tale of one city that responded differently to two crises: (1) the collapse of the financial system and (2) the scarring of the labor market. These are both emergencies. So why did we respond to the first emergency like an ambulance siren and the second like a harmless murmur of white noise? I can think of at least three explanations. The first two are the explanations I've heard, believed, and used. The third I hadn't fully considered until last week. But it might be the most compelling. (1) It's the basic fact that, without a financial system, there is no economy. This explanation blames pretty much nobody in Washington. In 2007 and 2008, the entire economy stood on the brink of collapse, and the only way to save it was by a historic all-hands-on-deck response from the Federal Reserve and Congress. In retrospect, you could say that we went too far to protect the biggest banks (some of which are even bigger, today) without ensuring similar financial protection for homeowners. And yet, while millions of underwater homeowners are an acute tragedy, you might say, they won't guarantee a lasting national depression. Without enough gainfully employed homeowners, you won't have a strong housing market. Without a banking system, you won't have a housing market, period. (2) It's all the Republicans' fault. This explanation blames half of Washington. Let's be crystal-clear about this: There is no doubt that Republican policies are disproportionately to blame for the shift away from stimulus. That's an easy story to tell, and I don't think Republicans would even dispute it. After all, they've argued that cutting spending would help the economy. The GOP has thoroughly convinced itself that spending-side efforts to fix unemployment are unworkable. In the last year, there has settled, even among the Democrats, a kind of reserved defeat that shows a stunning lack of urgency toward the crisis of long-term joblessness. From abandoning the payroll tax cut in late 2012, to quietly acceding to sequester, to going silent on unemployment, nearly all of Washington -- not just the right -- has essentially stopped talking about the most important economic issue of our time. High-ranking Treasury officials officials I've spoken with on background couldn't name any specific proposals they have to help the long-term unemployed. Instead, they've argued that general economic growth stuff, such as infrastructure spending, should be enough to put these 4 million people back to work. But the economic literature objects: Fighting vast long-term unemployment with general economic growth policies is like fighting pneumonia with Vitamin C.
So, why aren't even Democrats scrambling to fight for the long-term unemployed? (3) It's the mind-shifting power of money in politics. This explanation blames everything about Washington. Money might not buy elections. But it does buy the attention of electeds. 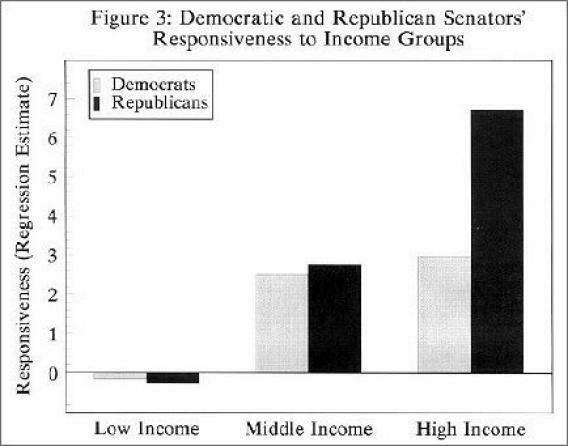 It subtly but substantially biases them toward the issues that most concern the rich. Let's begin with a zoom-out: Winning elections is more expensive than ever. Ironically, that makes it harder to "buy" elections, in the conventional sense, because both sides in marquee elections raise so much cash that each marginal dollar becomes less consequential (principles of inflation apply). But it also means that candidates are required to spend an egregious and unprecedented share of their time getting rich people to donate. Having a Rolodex full of wealthy folks is a prerequisite for winning federal representation. It's also a recipe for having your priorities shaped, if not determined, by hours spent going over rich-guy problems. "Being a candidate means being a telemarketer for 24 months before an election," Connecticut Sen. Chris Murphy said last week at a conference by the Yale Institution for Social and Policy Studies. But not just any telemarketer. A telemarketer for people with lots of money. After all, it doesn't make much sense to spend your limited time asking jobless families to send you their unemployment insurance. Even if money doesn't always change the outcome of political debates, it shapes what debates we have. We didn't have a debate about whether we should extend the payroll tax in December 2012. But we did have a debate about whether we should raise taxes on families making more than $250,000. Congress didn't vote to cancel the sequester when it learned it would cut unemployment benefits and assistance to low-income households. But it did cancel the FAA cuts when frequent flyers complained about security lines and departure times. Nobody on Capitol Hill is talking about long-term joblessness. We're still debating carried interest and the Volcker Rule. I'm paid to spend my day reading economic papers and asking people to explain their conclusions. Spending my time this way has persuaded me that long-term unemployment is a national emergency that is both devastating millions of families and making the country permanently poorer. ... Sen. Chris Murphy eventually joined the April 24 meeting on long-term unemployment. He was joined by two more Democrats. Sixteen of the 20 members of the Joint Economic Committee never bothered to show up. National Journal wrote a report. Liberals blogs expressed outrage. But the story quickly died, carried out by the effluence of the media cycle and the frenzied schedule of Washington, its writers, and its representatives. There were so many hearings to attend. There were so many calls to make.